Help gain visitor data by promoting the Experience Dedicated™ Destination program on your website or e-newsletter with a direct link to the survey. Below, find website banners in various sizes. 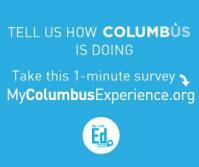 Simply download the banner in the size that works for you and post it on your website with a link to http://mycolumbusexperience.org. Please complete this form to order your Experience Dedicated™ Destination program supplies at no cost to you. Orders are fulfilled and delivered within two weeks using USPS or UPS.